†Our cheapest car insurance policy sold this year was just £91. We Compare 30+ Insurers For You! We Specialise In 40-70+ Year Olds! What is car insurance for mature drivers? Mature driver's car insurance offers a more competitive policy for you depending on your driving history. Our comprehensive panel of insurers offer a range of discounts, so you will no longer feel your no-claims history is not rewarded. There is no difference between our car insurance and our mature driver's car insurance, other than you getting rewarded for your driving experience. As a rule older drivers tend to drive less miles and reports suggest you are safer on the road. We offer excellent rates to reward this experience. As one of the UK's largest independent brokers, we specialise in providing Car Insurance for over 50's. We have developed relationships with insurers that allow us to offer extremely competitive pricing to our customers. Data shows that over 50's are less likely to claim on their policy - and as such, often have much cheaper insurance than any other age group. By working direct with insurers and underwriters, we are able to secure competitive pricing levels for anybody who is aged 50 or above. There is no difference what so ever between a car insurance policy or a mature driver insurance policy, the only difference is that you're rewarded for your driving experience. We can offer comprehensive, third party fire and theft or third party only cover. Buy a low insurance group vehicle. Fit a security device to your vehicle. Restrict the amount of miles you will be doing in a year. 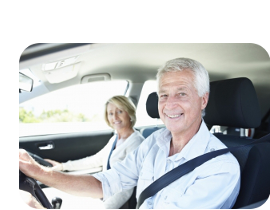 Why choose One sure insurance for your mature driver insurance? All polices offer fantastic cover and when you call or get a quote online, you will be surprised what a great deal you can get. We don’t cut any corners or reduce your risk to make a policy sound better; we simply offer a fantastic package that is suited to your specific needs and requirements. We will comprehensively search a huge selection of over 50's underwriters so we can find a package that is both cost effective and perfect for your needs. You are not restricted to just one payment option. We offer competitive payment methods, such as flexible monthly instalments. We have a 24-hour claims line in the event of an accident.